Welcome to Appcentre.co.uk. We are authorised resellers of Kerio Connect, Kerio Control and Kerio Operator and GFI Unlimited. Our experts can provide both software and hardware solutions using the Kerio Connect and Control applications on both Windows, Macintosh and Linux based systems. Appcentre.co.uk is a trading division of Second Chance PC Limited est 2001. Should you need any help pre, or post sales please contact us on 01223 833 412. GFI Unlimited is a subscription option that unlocks access to a wide range of software available on the GFI library, which includes all the Kerio applications, through a single subscription. It provides you the competitive advantage of powering your business needs through one simple and powerful system. Through GFI Unlimited, customers pay a flat price per user or unit, and can use as many of the included GFI solutions as they need. Kerio Connect is an all-in-one messaging and collaboration server for small to medium organisations. Kerio Connect combines advanced email, calendaring and collaboration features with integrated anti-virus, powerful anti-spam, built-in archiving, automated backup and an easy admin interface. The base package for Kerio Connect is a 5 user pack available with or without additional antivirus. Fully scalable you simply add the number of users required in packs to your base license. You may add further licenses at any time. New Kerio sales come with 1 year of software maintenance. Kerio Control, the best all-inclusive Internet software security and productivity solution for small to medium sized networks, featuring unified security, VPN, bandwidth controls, link load balancing, and other comprehensive tools to prevent multiple layers of Internet abuse. Kerio Control offers more hardware flexibility and scalability than traditional security appliances, and also includes Internet usage reporting that displays user browsing habits in detail. Complete unified threat management and network intelligence. Now available as standalone or as a virtual appliance. The base package for Control is a 5 user pack available with or without additional antivirus. Fully scalable you simply add the number of users required in packs to your base license. You may add further licenses at any time. 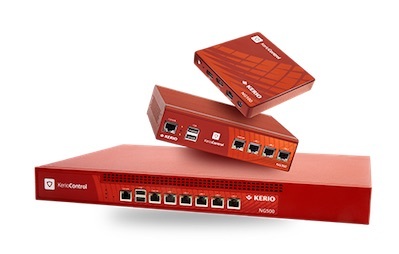 Kerio Control hardware appliances are all-in-one Unified Threat Management (UTM) solutions providing comprehensive next-generation firewall protection of your network and data. Each appliance includes a next-generation firewall and router, Intrusion Detection and Prevention (IPS), gateway anti-virus, VPN, and web content and application filtering. Shipped with the latest version of Kerio Control, all appliances also include one year software maintenance and one-year hardware warranty.